Many different types of blinds for selection and most of them are available in a wide range of colours – anything you want. 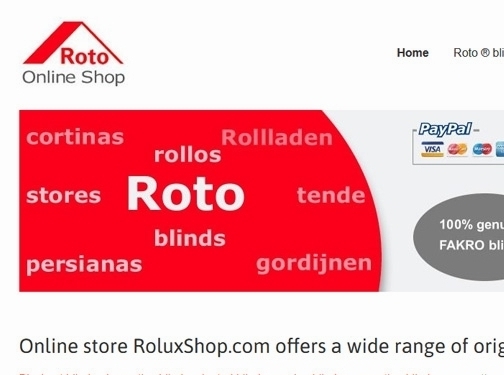 Thanks to the Roto blinds, finding the product that fulfils your needs in the best possible way should not be a problem. Regardless of whether you want blackout, privacy, protection against heat or even if you want all of these features at the same time. Blackout blinds Roto ZRV - they block the light that reaches the room and provide total darkness even in the middle of a sunny day. Decorative standard roller blinds Roto ZRE - adjustment of the amount of light and basic level of privacy. Venetian blinds Roto ZJA - they help to regulate the amount and angle of the light that reaches the room. Pleated blinds Roto ZFA - elegance and dimmed daylight. Poland (Wrocław) based business providing blinds for sale. Website includes details of products provided, FAQs, delivery information, full contact details.